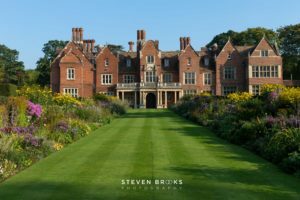 Recently I was asked to be the wedding magician at the beautiful Longstowe Hall which is just outside Cambridge. I’ve never performed at Longstowe Hall before and was taken aback by how lovely it is. In fact, it could have been built with modern weddings in mind! It originally dates back to the time of Elizabeth I, has a spectacular garden which sweeps down to a lake, and is surrounded by ancient woodlands. And yet it’s only a few minutes’ drive from the city of Cambridge. 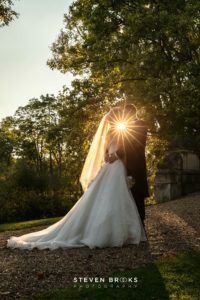 The venue has a marriage licence and the happy couple can choose whether to hold the ceremony in the historic Rose Ball Room, or under the gazebo which is on an island in the lake. The Ball Room and gazebo area can each seat up to 100 guests for the ceremonies. I was asked to perform for Yelsel and Tom’s 90 guests during the drinks reception immediately following the ceremony. 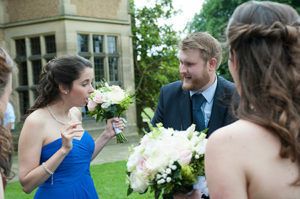 It was thankfully a beautiful summer’s day, so the ceremony had been held in the gazebo on the lake and guests were able to enjoy the Hall’s beautiful gardens as they sipped their drinks, chatted and were treated to some magic tricks. When it comes to the reception, the venue has its own marquee for up to 150 guests. The marquee is made from natural canvas which allows the tent to breathe, making it comfortable for your guests. Inside, it’s tastefully decorated with ivory lining, chandeliers and uplighters, and has a carpeted wooden floor with separate dance area. The party then moved into the marquee for dinner, and I performed some of my table magic between courses. By this point in the day, excitement has infected everybody and so magic really thrives when it comes to energetic guests as the buzz helps the guests enjoy the magic show and really let loose to enjoy their day. The magic was a perfect addition to the day – and you can see why for yourself. Yelsel and Tom were kind enough to allow me bring my videographer along to record my performance. Check out the video below to see what the day was like. There’s many more videos on my website showing me work my magic at a number of different wedding venues. 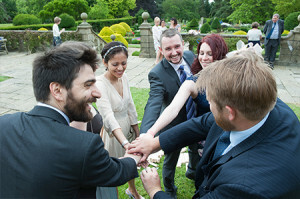 If you’re looking for a wedding magician in Cambridge, Hertfordshire or Essex, get in touch if you would also like to bring extra magic to your special day.